Offshore Fishing Costa Rica - A World Famous Destination! Anglers from all over the globe flock to the oceans of Costa Rica for its big game fishing. There is no better place than the deep seas of Costa Rica. Great numbers of both marlin and sailfish easily caught in the dozens on a great day. Are you already craving for adventure? Select any of these packages and begin planning an unforgettable vacation! Here is an itinerary for a perfect Costa Rica vacation: get some adrenaline rush, discover nature, and enjoy great sportfishing! Coast to Coast Fishing in Costa Rica! You'll fish on the Caribbean Coast for giant tarpon and snook before flying to the Pacific Coast where you'll fish for sailfish, marlin, dorado, tuna, snapper, and roosterfish. This is a perfect package for the angler that has done it all and is looking for his next great adventure: three nights on board and off-shore fishing! Crocodile Bay Resort has everything a sportfishing enthusiast could want - and more! Perfect fishing weekend getaway with two full days of offshore fishing on one of the most renowned spots for billfishing in the world. One of the best fishing vacation packages Costa Rica has to offer: experience four of Costa Rica’s top fishing destinations in just over a week! Combine big game fly fishing off-shore with freshwater fly fishing on a jungle river in the same trip - come to Quepos, Costa Rica's fly fishing capital. 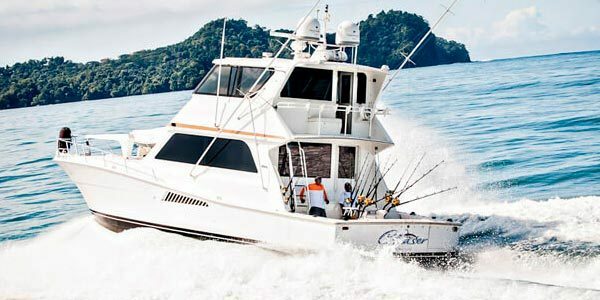 Combine world-class fishing with 5-star accommodations as you visit one of Costa Rica’s most popular beaches, Manuel Antonio. Fishing Highlights of Costa Rica! Experience the fishing highlights of Costa Rica as you visit the stunning Lake Arenal and then travel to sunny Manuel Antonio. 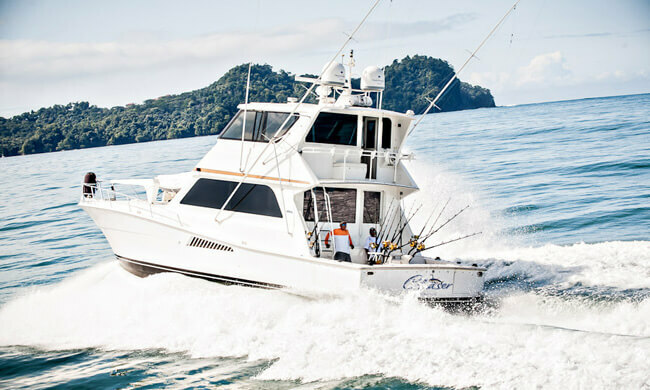 Are you ready for some offshore fishing Costa Rica? You are offshore once you hit 30 meters in. Here the boats get more robust, the fish harder to reel in, and the equipment more sturdy. Once you trade the small motorboat for a larger fishing vessel or a charter, you know you’re up to some serious fishing. Offshore boats are generally much larger than inshore boats, and may need to be moored in a marina. They are sturdily constructed so they can brave the weather and water conditions encountered in open waters. It’s safe to say that offshore has more of the unknown and thus, more variables to consider. This is why such activity requires more knowledge in navigation and safety precautions. Therefore, offshore fishing is usually targeted to more experienced anglers. Overall, offshore fishing is more physically demanding. If you imagine a long, relaxing day at the shore – you’re in for a surprise! Costa Rica provides one of the world’s best fishing experiences at just roughly a 2½-hour flight from most southern U.S. cities. It is also an excellent billfish destination and you can easily catch them in the dozens on a great day. In our offshore fishing trips you’ll usually troll around 10-20 miles from the shore. At this distance, you’ll have excellent chances at catching marlin in the 250-700lb range or sailfish in the 100-250lb range. So, if getting hold one of these great beasts has always been on your bucket list, we have a large variety of packages for you. There has been a lot of buzz about marlin fishing in Costa Rica. Over the past three years, many private boats have been traveling to the offshore seamounts here and raising unheard of numbers of blue marlin. From December to March, and even well into April and May, you’ll get excellent bite. Our elite charter fleet is now offering these trips to travelers as well. If you are eager to know why Costa Rica has given one more claim to fame in the fishing world, book with us and find out why!